Cleveland Paprika! Ball, February 24, 2007: The Cleveland Hungarian Development Panel Cordially invites you to the 2007 Paprika Benefit Ball Honoring Jerry Torma. This year's theme is "Romancing the Music," featuring Roberto McCausland Dieppa on Piano, Recipient of Pro Hungaria Award. AHF's Laszlo Buda is raising funds for United Way Hungary by riding his bicycle 1956 miles by October 23, 2006. He is seeking pledges/sponsorships in this 50th anniversary year of the Hungarian Revolution. "Laz" rode 1210 miles last year, so this would be 50% more - quite a physical challenge! Make a pledge and contact him at lazbuda@yahoo.com. See www.1956in2006.org and [read more] about Laszlo. National Hungarian Memorial Dedicated on June 12th, 2005. AHF's President Emeritus, Dr. Nadas Gyula, keynote speaker. Arpad Dobolyi of the Memorial Committee, chose the site for the National Hungarian Memorial honoring Hungarian heroes that perished in the fight against the communist takeover. The memorial is the culmination of over two decades of work. The idea of erecting a Hungarian Monument was proposed and organized by Mr. Dobolyi with the cooperation of the Hungarian community in 1984. The granite construction of cremation niches provides the background for the monument featuring the Hungarian Crest in the center with the Hungarian Turul on top. The Turul is cast in bronze, with its wings spread wide and clutching a sword in its talons. 1/10/2005 - AHF Members breaking ground on 1848 / 1956 Hungarian Memorial Monument in Lorain, Ohio. The Honorable Mayor Craig Foltin and the city of Lorain, through proclamation, designated a property on the corner of East 31st Street and Grove Avenue in Oakwood Park as the future site of the monument. The cost is estimated at $30,000.00 and your help is needed! Donors who give $100.00 or more get their names inscribed in the stepping stones. 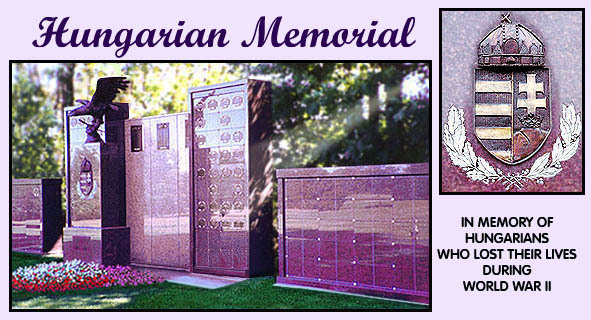 Leave your mark and help us build this monument to Hungarian bravery and democracy. Become part of the AHF family and let us help you get the word out about your activities!